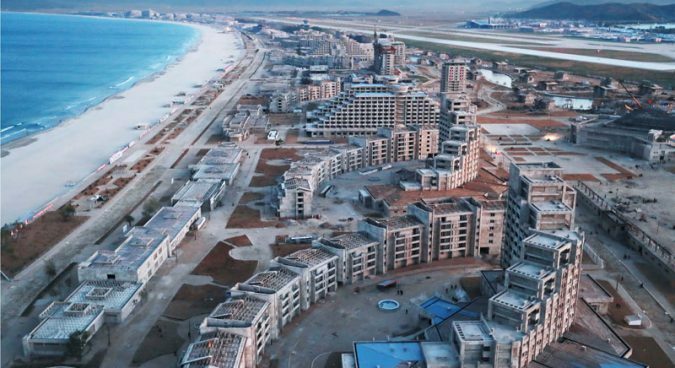 The Wonsan-Kalma coastal tourist area on North Korea’s east coast has seen rapid progress over the winter and appears to be nearing the final stages of construction, a review of recent satellite imagery suggests. Roofing has been installed on dozens of the zone’s large hotels, lodgings, and service buildings, while landscaping has taken shape surrounding many of the buildings and along the five-kilometer stretch of beach, raising the possibility the project may indeed meet Kim Jong Un’s October 10 target completion date. But following several changes to the zone’s blueprint already since work began in January 2018, the latest imagery provided by Planet Labs from March this year reveals a series of even newer buildings and annexes constructed just since last December – including one of the tallest structures yet. Other elements demanded by the DPRK leader, such as “hotels and inns with over 30 floors,” have yet to take shape, however. Whether the tourist zone is officially declared complete by this fall or whether tourists are actually invited to roam the facilities will, as a result, largely depend on interior finishing, roadwork, and the installation of other amenities advertised such as a tourist tramcar. The above image shows the progress made on many of the nearly 200 buildings in the zone since late last November, with landscaping appearing nearly complete along the entire coast and the northern section seeing the most number of buildings fitted with final roofing. The north is also the site of the newest large structure – likely a hotel based on its design – that was built in the same spot as an olympic-sized pool already completed last summer. That pool was demolished in mid-September, a review of satellite imagery showed, following Kim Jong Un’s second visit the previous month, while the new building’s foundation began to take shape around early November. It now appears to stand over 12 stories tall, similar to a few other hotels in the same section. One sign that work on interiors may be lagging behind, however, is in the adjacent indoor water park, where a bare concrete floor still appears through the glass pyramid roof in imagery from both last November and this month. Even further north on the peninsula, the basic structure of a large pier facing downtown Wonsan across the bay was completed by mid-March. Its purpose is yet unknown, but as it takes up a large footprint similar to the size of the many hotels in the zone, it could house buildings or even a fun-fair as Kim Jong Un previously requested be built. Along the central section, characterized by mostly service facilities, there appears to have been less progress in recent months, with most still missing their final roofing and with work on annexes and new buildings still in the early stages, according to the latest imagery. Notable additions in this section include new structures taking shape in the lots of both the planned telecommunications station and financial services center. An early blueprint labeled the former as an “international telecom company” building, though the map shown during Kim Jong Un’s August visit appeared to drop references to foreign involvement. New buildings also sprouted in the apartment complex meant for long-term or permanent residents, while even more changes to previous plans can be seen in the form of construction on a new large concrete foundation which only began early last November, and which resembles outdoor waterparks in other parts of the country. Beyond the zone’s southern boundary lies a large complex of temporary structures including both soldier-builder housing as well as staging and storage for building materials, though the latest imagery shows blue roofing for many of the structures has been removed in recent weeks, possibly to be used elsewhere. The zone may also be expanding, however, as an entire group of buildings was also moved around 300 meters to the south in the first two weeks of March. It appears preparations are now underway for new permanent buildings in their former place near the southern entrance to the tourist area, across from the apartments and management facilities. Sanctions are also likely to have an effect on efforts to procure more specialized items needed for the thousands of hotel rooms, shops, and leisure facilities. And with state media reporting less in recent months from the inside of the Wonsan-Kalma construction site compared to other sites such as the Samjiyon revitalization project, it’s difficult to determine how interior construction is coming along.